The advisory panel to the government said the devices produce "a number of compounds of concern", including some that can cause cancer. Manufacturers say their products are aimed at smokers who want the "taste of tobacco with no smoke and less smell". The panel was concerned that young non-smokers might start using the products. There were also worries that the products could lead people to take up smoking cigarettes. The Committee on Toxicity (Cot) looked at the available evidence about the risks of two heat-not-burn products that have recently gone on sale in the UK - IQOS and iFuse. The devices heat tobacco to a high enough temperature to create a vapour but not smoke. They are different to e-cigarettes, which vaporise a liquid containing nicotine - the highly addictive compound in tobacco smoke. The committee found that people using heat-not-burn products are exposed to between 50% to 90% fewer "harmful and potentially harmful" compounds compared with conventional cigarettes. But it was unable to quantify the exact health risk. Prof Alan Boobis, committee chairman, said: "The evidence suggests that heat-not-burn products still pose a risk to users. There is likely to be a reduction in risk for cigarette smokers who switch to heat-not-burn products but quitting entirely would be more beneficial." There was not enough evidence for the committee to compare heat-not-burn with e-cigarettes. But the committee noted: "If people perceive e-cigarettes as safe this perception could transfer to heat-not-burn tobacco products, despite a lack of data on which to establish this." Public Health England says there is a large amount of evidence that shows e-cigarettes are much less harmful than smoking - at least 95%. "We encourage smokers to try e-cigarettes as a way of stopping smoking. People who combine e-cigarettes with support from their local stop-smoking service have some of the highest quit success rates." 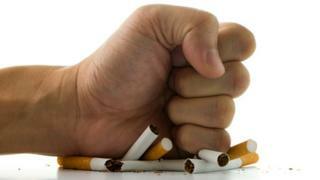 Quitting tobacco-use completely is still the healthiest option, say health experts. A spokesman for Philip Morris Limited, which makes IQOS, said: "We are encouraged by today's statement of the UK's Committee on Toxicity and will continue to share our scientific evidence. "We believe that smoke-free alternatives, including heated tobacco products like IQOS and e-cigarettes, have significant potential to be less harmful than cigarettes and can play an important role for smokers and public health." Simon Clark from the smokers' group Forest said: "Electronic cigarettes are a step too far for many smokers so if the government wants smokers to quit there has to be a range of products that fills the gap between combustible tobacco and e-cigarettes."